Writing prompts and I mix about as well as oil and water. I don’t want to do pointless exercises. Translation: if it doesn’t add words to my work-in-progress it is pointless. 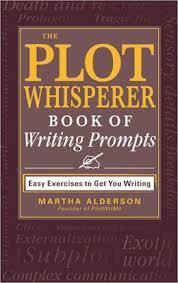 When I received my copy of The Plot Whisperer Book of Writing Prompts, I was skeptical. As much as I adore Martha Alderson’s Youtube videos, I just didn’t see how a book of prompts could get me moving. Alderson designed her book with 120 prompts divided equally among 4 sections—The Beginning, The Halfway Point, The Crisis, and the Climax and Conclusion. Let’s say you’ve already worked up the beginning of your novel. Now you’re floundering in the middle. Turn to that section. Seem to have lost all steam as you reach the Crisis? Again, turn to that section in the book. Each prompt is actually a grouping—an affirmation, a plot prompt and a writing prompt. The affirmation is a “you go” section to help prime the pumps. Next comes the plot prompt which reminds you what you should be considering right now in terms of story development. It might have something to do with your character’s goals or the setting or even the antagonist. Last but not least is the actual writing prompt with instructions for a scene in your story. The wondrous thing about these prompts is that they are designed to be helpful no matter what kind of story you a writing. Mine is a middle grade fantasy. Not an adult novel. Not a screen play. Not a mystery. Yet, the prompts that got me going could be used in each of these kinds of writing. The first prompt was to write a scene in which your protagonist takes a step to achieve his goal. My character took such a step, and I pulled down 1200 words. The next day I used a prompt about setting. I always know where my stories take place but the details are hard pressed to make it into the manuscript. This prompt enabled me to move my plot along and set the story more firmly in my fantasy world, and I compiled another 1000 words. Unlike many other programs, Alderson asks you to come up with your own goal. Planning to write a screenplay? Or a novel? See how long a comparable work is, then divide that number by 30. Write this number of words daily for 30 days and you will have a completed draft. All you need to get yourself moving are the prompts in this book. How do I know? 2200 words in two days and counting. Not bad for someone who can’t stand writing prompts. I love prompt books to get the creative juices flowing. I have The Plot Whisperer on my Kindle and on my to-read list. This just gave me added incentive to move it up the list. I have always loved prompts, but find that many are more tailored to writing flash or short stories. I love that this book is geared toward longer stories. I love The Plot Whisperer, so I'm positive this book is just as fabulous! If this is half as good as the Emotion Thesaurus it's a must-have. Thank you, Sue, for so clearly describing the intent of the PW Book of Writing Prompts and how to use and get the most out of the book. I love reading that the prompts are inspiring significant word counts for you. I'm really intrigued by this book and how it works. I would love to give this book a try. I'm working on the rewrites to my first book. Great review and a hearty reminder. I, too am a huge fan of Martha Alderson. I love how she is able to demystify plot yet still keep it magic. Quick update. I used two more of the prompts and have now added 4800 words to my novel. Flexible enough to be useful but pointed enough to make me think about what needs to happen in my story. I'm not sure I'm a novel kinda gal. I've been working on my collection of short stories - they come easier to me...but I do have a novel in the beginning stages - and I'm stuck. I love using prompts, and am interested in how they can further develop my novel. I just recently found this blog and can't stop reading! It would be wonderful to win a copy of this book...I believe it would be very helpful to my writing process. Thank you! I'm working on a young adult novel and using the oter 2 plot whisperer books already. I can't wait to get ahold of this one too! Do you think the prompts made you write more than you normally would have and/or better than you would have without the prompt? I'm curious if I could use this book as part of my children's novel writing workshop? Wonderful review, Sue! I love that the prompts actually help you complete your novel. And the idea of dividing your word count by 30 is fantastic. Sounds like another must have for my library! For me, the problem has been that I've had too many deadlines. I do the paying work and then don't work on the novel. Just can't work up the momentum to transition into one more project. The prompts help me do that so I am writing more than I would otherwise. Better? I don't know because this is a rough draft. My rough drafts are just that...rough. It would be a helpful tool for your students to learn to use when they get stuck. Well darn, it looks like I am going to have to get another writing book if I don't win it. This looks really good! Love books on prompts! Thanks for this giveaway! I love anything that can help get those words flowing even a little bit easier. Your review was so detailed and I was really excited to see how this book helped you - 2200 words in two days is exactly what I need to get my book moving again! Thanks! I have her other two books, one in ebook form and one in hard copy. I've been avoiding writing prompt books because I have all the stories I need, but the way you describe the book, as prompt to help you work through a story you already have, make me very interested in it. A young adult series I'm trying to start. So many writing prompt books help me start NEW projects, but this one is unique in that it will help me stay focused on my YA novel I started in Nov for NaNo :) Pick me!! Your review has just sold me on the book. I've been wondering if I really need another craft book (I have so many), but this sounds like something I could use. I'm the same way with writer prompts, but loved the ones in Donald Maass's latest book. I like how this book is structured. I agree that unless it is going to help my WIP, a prompt book may not seem necessary. I'm interested in this though. Could provide helpful when you're stuck in a rut. Martha has some really great ideas and I love her twitter posts.